Mansfield Town winger Reggie Lambe will be hoping for a start for Bermuda in their opening Caribbean Cup qualifying match in Cuba tonight. But Stags boss Adam Murray wishes Lambe were back in England preparing for Friday’s trip to crucial Wycombe Wanderers. 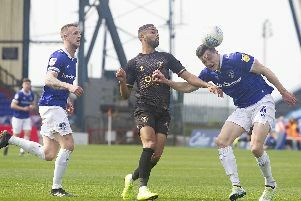 Lambe has 19 previous caps, scoring four times for his country, and will miss both Easter games on top of last weekend’s draw with Portsmouth as the squad take on Guyana on Sunday in their other Group Three match. “It’s always bad timing,” said Murray. “They picked a relegation battle to do it last year. So well done them (Bermuda). “We are in a hunt to get the play-off spots and you lose Reggie, who has been an influential player for us. He has been someone over the last couple of years I have trusted. “In the relegation battle he played a lot of games for me and he’s played a lot of games for me this season. “The timing was a bit annoying but I understand the prestige of playing for your country. “I am not going to turn someone’s head that has made a decision they’d like to go and represent their county. He added: “If his statement is ‘I want to go’ then no problem. If you are in the trenches with me you’ve got to be 110 per cent in the trenches with me. Lambe’s international team mate, striker Nahki Wells, has made the opposite decision and is putting club before country and staying home to help Huddersfield Town in the Championship. The Caribbean Cup, established in 1989, will be contested by 25 teams, with four taking part in next year’s finals. Jamaica are the holders and have been winners six times in 17 tournaments. Trinidad and Tobago have won the cup eight times while Martinique, Haiti and Cuba have also been champions. Another Stags man away on international duty this weekend is Tanzania striker Adi Yussuf. With him serving a five-game ban and unable to play for club or country, Stags boss Murray said Yussuf had gone for the experience. “It’s his second call-up and, because he is suspended with us, it is a good opportunity for him to go and see what it’s like and join in with the lads, train with them and be involved in that environment,” explained Murray. “It will be a great experience for him and a good part of his learning curve. “He has come from non-League and taken major steps over the last nine months, so we have allowed him to go away and train.